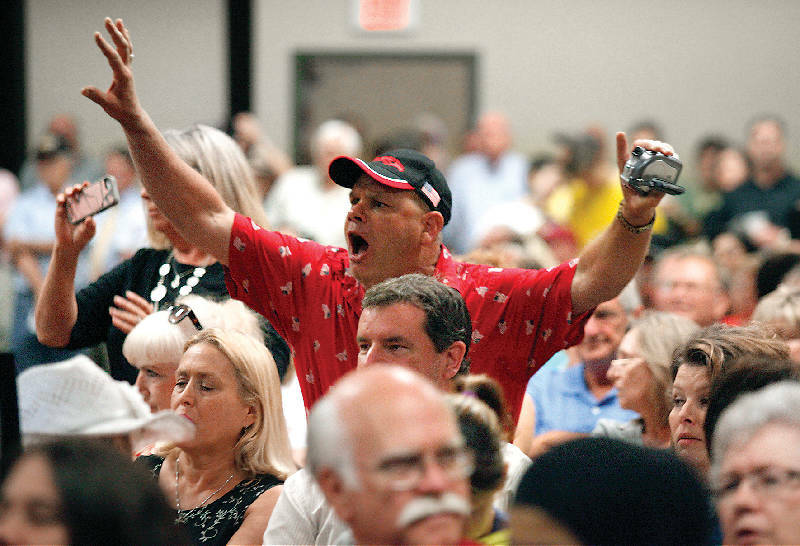 An unidentified man shouts to U.S. Attorney Bill Killian as he speaks in the Manchester-Coffee County Conference Center during a meeting Tuesday called "Public Discourse in a Diverse Society." Attorney Bill Killian, left, talks with FBI Special Agent in Charge Kenneth Moore in the Manchester-Coffee County Conference Center Tuesday before the start of a meeting called "Public Discourse in a Diverse Society" in Manchester, Tenn. POLL: Does free speech have its limits? MANCHESTER, Tenn. - U.S. Attorney Bill Killian was greeted with shouts of "traitor," "serpent," and calls to "resign" or "go home" Tuesday night at an event aimed at improving relations between local residents and their Muslim neighbors. Killian and Kenneth Moore, special agent in charge of the FBI's Knoxville office, were featured speakers before a hostile crowd of well over 300 at the "Public Disclosure in a Diverse Society" event at the Manchester-Coffee County Conference Center. He told the audience that despite 50 prosecutions and convictions of hate crimes in his district, "far too many people are still repeating the same vicious acts against the Arab-Muslim ... "
State Sen. Mike Bell, R-Riceville, said he attended the event because "I had concerns when I read Bill Killian's statement [announcing it]." After the event, Bell said he still was not certain of Killian's position on free speech. Outside, about an hour before the planned event, more than 200 protesters braved the 90-degree heat outside the conference center to hold up signs and sing patriotic songs. Some called it a "pre-rally" to gather those opposed to any encroachments on free speech. Remziya Suleyman, left, and Drost Kokoye listen to a Muslim guest speak in the Manchester-Coffee County Conference Center Tuesday during a meeting called "Public Discourse in a Diverse Society" in Manchester, Tenn. Some people at the impromptu rally were handing out anti-Islamic literature, other patriotic materials and some Christian materials as several speakers were using a megaphone to work up the crowd. One man's sign read: "In America, you are free to practice your religion, and I am free to insult it." Bell Buckle, Tenn., resident John Anderson, the sign's author, said he wanted to know "why two federal employees are not looking into [Attorney General] Eric Holder" rather than holding the night's event. "Let me be clear, in this country, hateful speech is allowed," Killian said. "It is protected by the freedom of speech part of the first amendment. "But if someone makes threats of violence, that is not protected speech and they will be prosecuted," he said. "Likewise, if someone commits acts of violence under the guise of religious or other speech, they will be prosecuted for their violent acts." Controversy arose earlier this year in the community over a Facebook post by Coffee County Commissioner Barry West, who drew fire for posting an illustration showing a man in a cowboy hat pointing a double-barreled shotgun at the viewer with the caption: "How To wink at a Muslim." Protesters gather outside of the Manchester-Coffee County Conference Center Tuesday before the start of a meeting called "Public Discourse in a Diverse Society" in Manchester, Tenn.
"I wish to issue a heartfelt sincere apology to anyone I have offended or hurt in my sharing of the Facebook picture," he is quoted as saying in the May 8 edition of the Manchester Times. First Amendment Center president and executive director Gene Policinski said before the Manchester meeting on Tuesday that the details of the threat and the specificity of its target are significant in determining how federal law applies to comments made in a public forum. The threat "has to be likely, imminent and directed at a specific person," Policinski said. He said remarks such as those made by West are protected speech. Killian didn't address West's post, except to acknowledge that it created a stir in the community. "While [West's] cartoon might be tasteless and crass and juvenile and even hateful, I think the founders of this nation provided for people to be able to express those views," Policinski said. "When it comes to a public official, I think the market place idea is protected under the First Amendment, where voters can decide if this is the kind of person whose opinion and whose judgment they trust to hold public office." In all instances, the First Amendment "requires government to really demonstrate that it's a true threat before they can restrict our speech," he said. Contact staff writer Ben Benton at bbenton@timesfreepress.com or 423-757-6569. Subscribe on Facebook at facebook.com/ben.benton1 and follow on twitter.com/BenBenton.